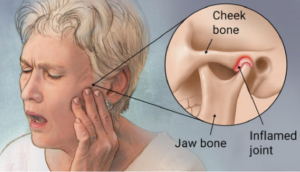 In additional to a change in facial dimensional proportion and shape, the loss of one or multiple teeth can cause jaw joint dysfunction (TMJ disorders). The musculature, ligaments, and cartilage around your left and right TMJ’s work in tandem to create a harmonious gliding and sliding motion. However, when your bite is skewed due to one or more missing teeth (or even an incorrectly placed filling or crown), the jaw joint (TMJ) may not work correctly. Imagine walking with a small pebble in one shoe. The annoyance will start to hurt, leading you to favor one foot over the other, and pretty soon, you will have postural issues. This is similar to what can happen to your TMJ, causing headaches or shoulder and neck issues, due to the discomfort in your jaw. Making it difficult to eat the foods you used to, now your nutritional health starts to suffer. The most common signs of TMJ disorders may be a “popping” or “grinding” sound, or even episodes of a “locked” jaw. All of these can affect your quality of life and in most cases can be corrected. Call Dr. Huang at (703) 532-7586 to see what your options are for your missing teeth—don’t let it lead to a TMJ disorder! Having your bite in correct harmony is even more important when you are adding prosthetics, such as crowns, that use dental implant screws as their artificial roots. The bite must be adjusted perfectly, or components such as the screw could loosen, or worse the implant itself may be overloaded and fracture (break)!